North Texas business leaders, seeing the economic risks that climate change poses to our region, are pressing Congress for action. They want a price on CO2: a market signal that will create economic opportunities, reduce pollution, improve health, and strengthen security. This step is critical to mitigating climate risks and preserving our vibrant regional economy. While many businesses have taken measures to reduce greenhouse gas emissions, long payback periods reduce the incentive to make some important investments. The existing market signal is driving progress, but not at the pace required to drive down the emissions curve fast enough. We need a stronger market signal. Many North Texas business leaders agree that a price on CO2 is the right policy response, and they are communicating that support to Congress through a campaign coordinated by Citizens’ Climate Lobby (CCL). Your support can help persuade Congress to Act on Climate! CCL’s market-based proposal has three elements: (1) a gradually rising, predictable, national fee on oil, gas and coal, based on their relative CO2 content; (2) return of the revenue generated by the fee to U.S. households on a per capita basis; and (3) a border adjustment to protect U.S. businesses and motivate other countries to price CO2. By implementing this revenue-neutral fee, Congress can strengthen the incentive for businesses to take these steps. Pricing CO2 will create jobs for North Texans, increase GDP, improve our health and strengthen our national security. Members of Congress need to hear that acting on climate is important to their constituents, so CCL’s North Texas volunteers are coordinating a Leaders’ Letter campaign and a Business Roundtable event next spring. The Roundtable will be a forum for private sector leaders to talk about the progress they have made toward sustainability in their operations, the importance of it to their business cultures, and the steps they are ready to take when the right market signal is in place. The Leaders’ Letter to Congress asks North Texas members of the U.S. House to take specific actions on climate: (1) become a co-sponsor of H.Res.195, “Expressing the commitment of the House of Representatives to conservative environmental stewardship” (which currently has 23 Republican sponsors); (2) join the bipartisan House Climate Solutions Caucus (currently at 31 Republicans and 31 Democrats); and (3) help advance a bill to price greenhouse gas emissions. Learn how your business can support this effort! Contact us at NTX-BCL@citizensclimatelobby.org. Larry Howe and Ann Drumm are volunteers in Plano and Dallas for CCL, a nonpartisan grassroots organization with over 440 chapters. GBCI has announced its 2017 class of LEED Fellows, an annual recognition of outstanding LEED professionals. This year’s 23 LEED Fellows exemplify a diverse array of achievements and contributions to the green building community and LEED, the world’s most widely used green building rating system. USGBC Texas is proud to recognize two of our very own Chapter leaders who have joined the ranks of this prestigious group, Chris Mundell and Heather Holdridge. Chris has been involved in a variety of architecture projects for the past 20 years, ranging from healthcare, commercial, educational and multifamily residential clients. Currently at Gensler, he wears multiple hats including being a Senior Project Manager, a Community-Flex Studio Operations Leader and a South Central Region Design Resilience Leader. He has also managed the sustainability services for 12 LEED certified projects, including two platinum certified for the UNT Apogee Stadium and HKS Headquarters. He is also actively involved in the local chapters of AIA, CSI, and USGBC. 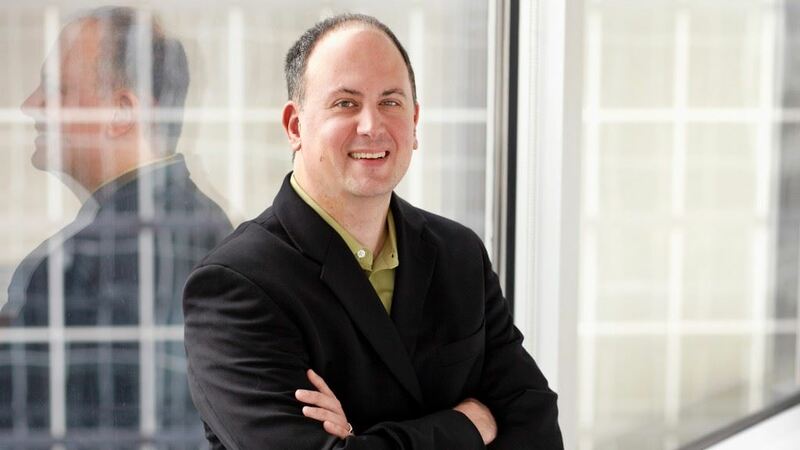 Chris is the past Chair of the USGBC Texas North Region Council, serves on the 2030 Dallas District Leadership Council and a past-president for the CSI Dallas Chapter. Heather is the Sustainability Director at Lake|Flato Architects. Leveraging her mechanical engineering backround, she directs all Lake|Flato teams in establishing and achieving sustainbility goals by devising strategies and systems under programs such as LEED, the 2030 Challenge, and the Living Building Challenge. Heather works closely with teams to evaluate passive systems and performs energy modeling throughout the design process. 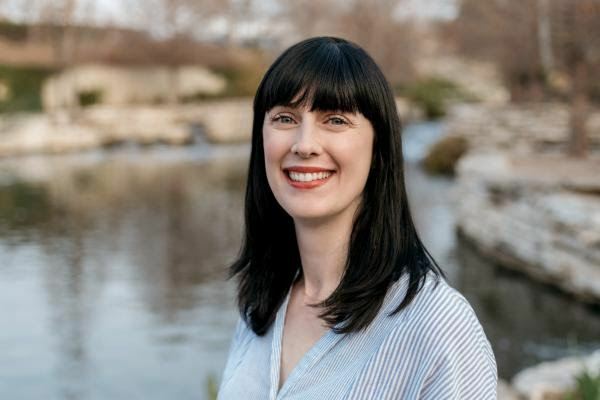 As an active Board Member for USGBC, Heather has been instrumental in establishing LEED standards and is Co-Chair of the San Antonio AIA Committee on the Environment. The LEED Fellow program was established in 2011 to honor LEED professionals who have demonstrated exceptional achievement in key mastery elements of LEED certification and significant contributions in teaching, mentoring or research with other industry professionals. LEED Fellows also have a strong history of highly impactful commitment, service and advocacy for green building and sustainability. LEED Fellows are nominated by their peers and must have at least 10 years of exceptional impact in the green building industry and hold a LEED AP with specialty credential, among other requirements. The evaluation process includes extensive portfolio review and is carried out by the LEED Fellow Evaluation Committee and supported by GBCI. The recipients will be honored at the 2017 USGBC Leadership Awards Luncheon at the Greenbuild International Conference and Expo taking place Thursday, Nov. 9, 2017 in Boston. The nomination period for the 2018 LEED Fellows class will open in February 2018. For more information about the LEED Fellow program and LEED credentialing, visit usgbc.org/credentials. The High Performance Schools Summit was held on Thursday, September 28 to gather together stakeholders interested in developing high performance schools in Texas. In light of recent events, the summit also addressed the incorporation of resiliency strategies into school buildings to allow them to perform as community resources in the event of emergencies, as well as being important community hubs during non-emergency times. The event kicked off with a Keynote from the City of Houston Education Director, Juliet Stipeche, who shared her recent experience of school buildings as "Shelters of Last Resort," as seen during Hurricane Harvey when districts all over Houston opened up their facilities to support their community members in need. She also discussed the importance of school buildings to the success of students and how healthy, inspiring buildings can play a key role in providing social equality to economically disadvantaged students. Following Ms. Stipeche was Mike Dieterich, an environmental scientist with extensive experience working with DC Public Schools to turn their school buildings around from some of the worst in the country to some of the best, all while saving millions of dollars in operating costs. We also heard from a panel of architects at Gensler, Kirksey, and Rogers who reviewed case studies of projects that have saved taxpayer dollars while providing inspiring and healthy community resources in which students can thrive. The event wrapped up with a Keynote from Anisa Heming, the Director for the Center for Green Schools. Ms. Heming first began working with the USGBC in New Orleans after Katrina, tasked with coordinating the LEED efforts of the Recovery School District. Her experience working with multiple stakeholders and a wide array of projects to incorporate green building and resiliency strategies into rebuilding efforts were timely and inspiring. In all, the Summit provided a venue for interested parties to come together around common goals, network, and learn more about high performance schools. The conversation will continue through the Green Schools Leadership Coalition being developed. The first meeting of the coalition will be on October 31, from 11-12:30 at a TBD location. The meeting will also be webcast. Please visit www.txgreenschools.org for up-to-date information and to join the Leadership Coalition. We are seeking membership from many stakeholders: school district administration and school boards, educators, curriculum developers, architects, engineers, energy managers, legislators, associations (A4LE, TEMA, ASHRAE, TASA, TASB, etc) and more. Please contact caroline.kostak@gmail.com with any questions. 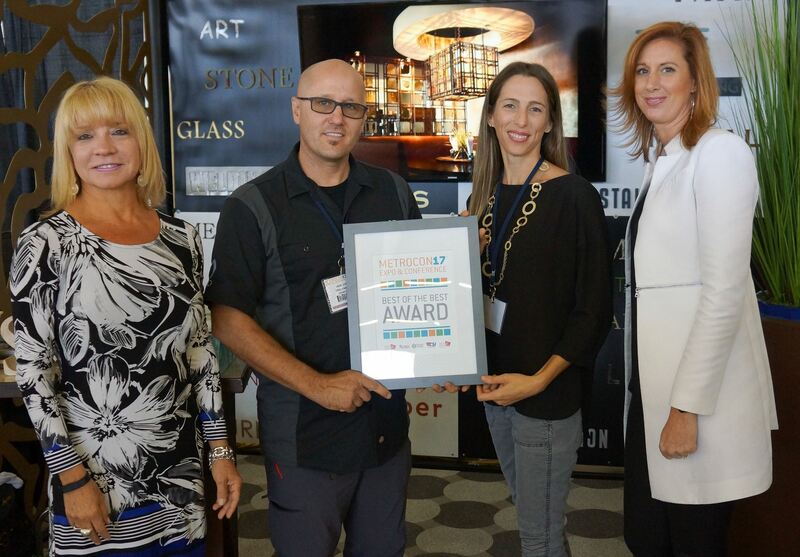 On August 10th & 11th, Dallas Market Hall buzzed with interior designers, architects, specifiers, facility managers, real estate professionals, design students and other essential industry members catering to the built environment when it hosted METROCON17 Expo & Conference. 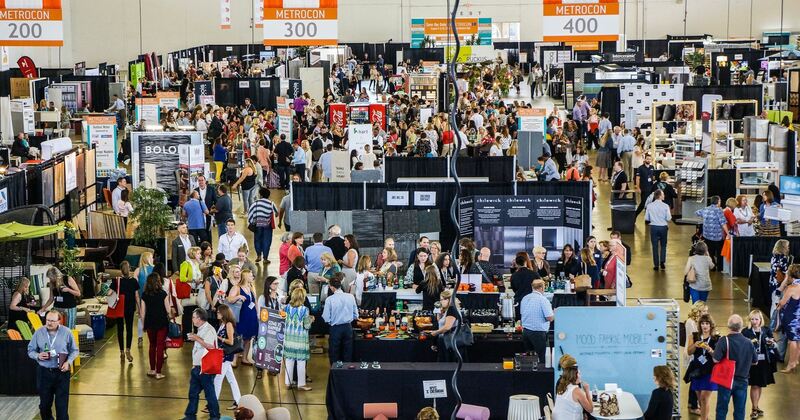 The event, which is the largest not-for-profit, self-produced, volunteer-driven, design specification-focused regional expo and conference in the USA, attracted individuals from 35 states besides Texas, as well as four Canadian provinces. For the first time, five associations joined forces to plan a more expansive event for their members and beyond. The USGBC Texas Chapter was proud to join (in alphabetical order) the ASID Texas Chapter, the ASID Texas Gulf Coast Chapter, the CSI Dallas Chapter, and the NEWH Dallas Chapter to execute this career- and business-building event. Companies secured 53 event sponsorships, more than any other year in the event’s history. 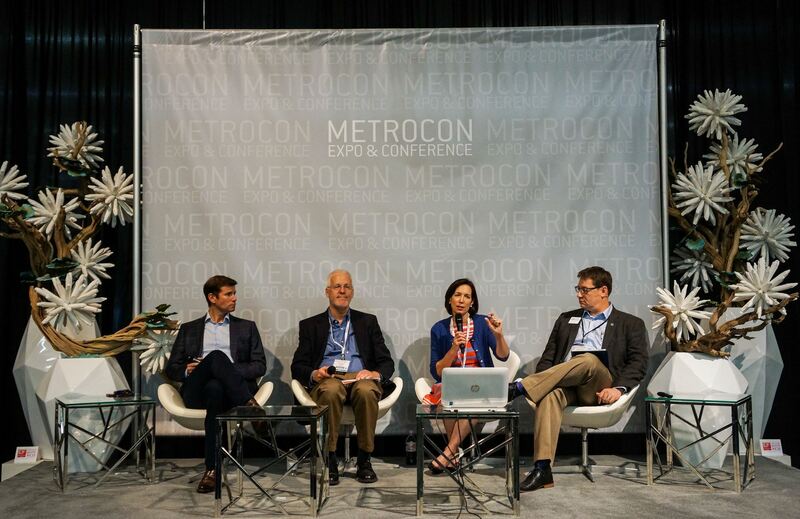 With the five partnering associations working together to create such a valuable opportunity for the region, METROCON is symbolic of what is happening with the industry in terms of the increasing need for multi-disciplinary collaboration within the built environment. The panelists discussed how the increasing levels of project complexity and expanding technological tools, as well as concerns of sustainability, resiliency, and wellness, are all driving our industry towards deeper cooperation within all market sectors. Headlining as this year’s Keynote Speakers were Sandy Chilewich and Joe Sultan, partners in life, work, and innovation, and the dynamic duo behind the global company Chilewich | Sultan LLC based in New York City. For the first time ever, Sandy and Joe took the stage together to share the ups and downs of building and maintaining a successful manufacturing business, as well as the real challenges of working with one’s spouse. Their candid comments were refreshing, inspiring, and extremely entertaining. “Introduction to The WELL Building Standard”: Corgan’s Caroline Compton, WELL AP, RID, explained how this performance-based rating system marries best practices in design and construction with positive behavioral aspects that have been proven to increase productivity, health, employee satisfaction, and employee retention. “Design Dish”: Five restaurant designers – William Baker w/ Jones Baker, Miguel Vincens & John Paul Valverde w/ Coeval Studio, and Royce Ring & Alex Urrunaga w/ planBgroup – discussed how they are maximizing the consumer appeal, operational efficiency and success of F&B concepts. They shared upcoming design previews, as well as their viewpoints on the new regional restaurant trends and why some concepts do not have the longevity to stick around. “How to Navigate the FF&E Process – Conceptual Design to Installation, the Players and their Roles”: This panel discussion featured a senior interior designer (Kenda Draper, ASID, RID, LEED AP ID+C w/ SmithGroupJJR), a designer with a university (Stephanie Andrus w/ Texas Women’s University), a dealer project manager (Lynn Meeker w/ Wilson Office Interiors), and a furniture representative (Sonya Odell, FASID, RID w/ The Ginger Grant Group), who collectively explained how to get the best project from the initial design concepts to the final move-in. METROCON17 also featured 45 CE courses over two days covering a wide array of topics applicable to various design practice areas. All CE courses were cumulatively reviewed and approved by IDCEC, 21 were AIA-approved, 17 GBCI-approved, 14 EDAC-approved, and 41 hours had HSW content to meet TBAE CE requirements for Registered Interior Designers & Registered Architects in Texas. Manufacturers, fabricators and service providers catering to the education, healthcare, hospitality, institutional, multifamily, residential, retail, and workplace design sectors filled 36,000+ SF of exhibit space, showing and/or sponsoring under 277 names, 90+ of which were not on last year’s list. Types of products and services exhibited, which can be continued to be referenced on our Interactive Floorplan, ranged from coatings, ceilings, decking, plaster, wallcovering, doors and windows to carpet, resilient flooring, tile, natural and engineered stone, fabric, furniture, wood flooring, window treatments, and solar control solutions, as well as art, lighting, signage, acoustical solutions, systems integration, metal fabrication, electrical controls, and consulting engineering solutions. We enthusiastically thank Landmark Sponsor STAPLES Business Advantage, Media Sponsor Modern Luxury Interiors Texas, and the 51 other METROCON17 Sponsors for their incredible support. Congratulations to the recipients of the 2017 Pegasus Exhibitor Awards! Many thanks to USGBC Member Mary Dickinson, Assoc. AIA, RID, LEED AP BD+C, for devoting several hours during the show to be the USGBC representative on the Pegasus Exhibitor Awards judging team, and kudos to the many chapter volunteers who manned the USGBC Texas Mobile Experience Center, which was a big hit on the trade show floor. The Committee and I also want to express our heartfelt gratitude to the many volunteers who donated their time on-site during the show to assemble attendee tote bags and speaker gift bags, guide attendees, introduce speakers, and monitor CE courses. This event could absolutely not happen without you! 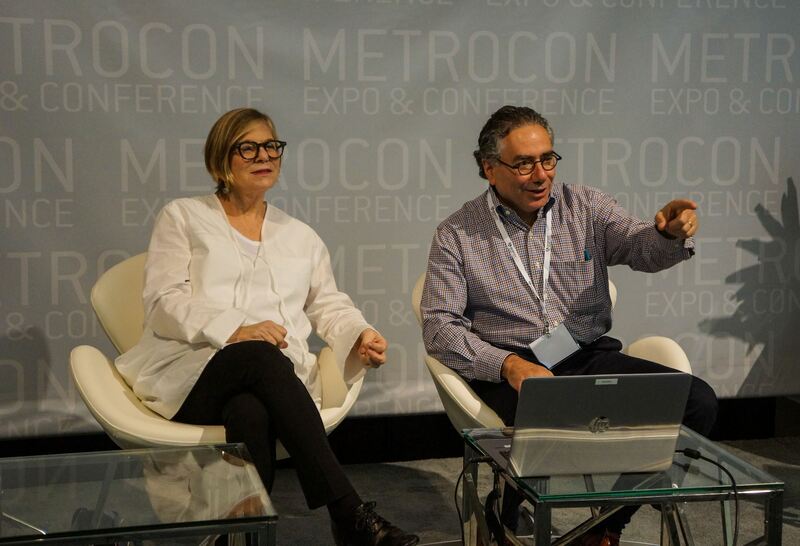 We were thrilled to present the METROCON17 Keynote Award honoring Keynote Speakers Sandy Chilewich and Joe Sultan of Chilewich | Sultan LLC. 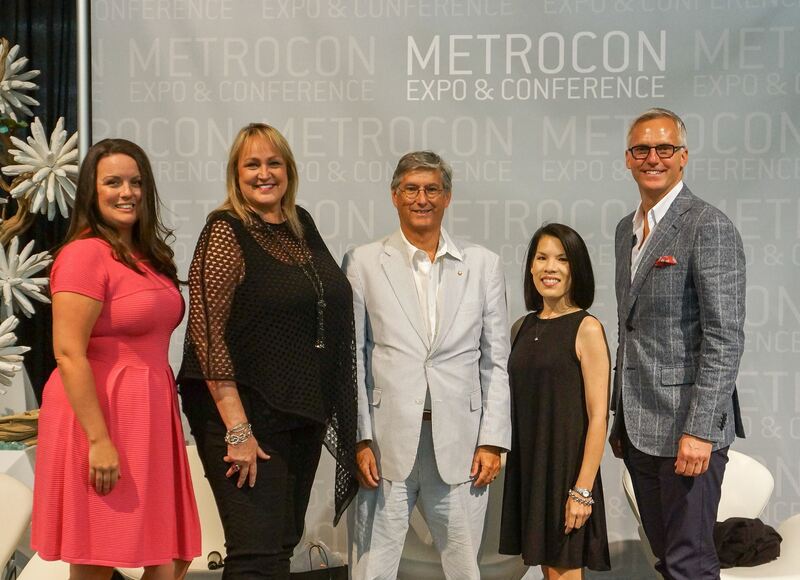 On their behalf, Metrocon, Inc. has donated $1,000 to the Interior Design Educators Council (IDEC), whose mission is the advancement of interior design education, scholarship, and service. IDEC President-Elect Hepi Wachter, ASID, CAPS, LEED AP, and IDEC Southwest Regional Chair Kristi Gaines, PhD, IIDA, Allied ASID, gladly accepted on IDEC’s behalf. Additionally, any income from this year’s event will go to the Committee members’ respective built environment organizations to fund valuable programming and scholarships or to those organizations’ respective foundations and designated charities. Put it on your calendar now: METROCON18 Expo & Conference will take place back in Dallas on August 9 & 10, 2018. Visit metrocon.info to find links to view photos from this year’s show and to sign up to receive notifications to stay informed about attending and/or presenting, sponsoring, and exhibiting at next year’s show. See you there! Across Texas, a voluntary program is being implemented that helps improve the environment, creates jobs and saves Texans money on their utility bills. Commercial Property Assessed Clean Energy (C-PACE) is a proven, accessible financial tool that enables Texas building owners to upgrade facility infrastructure with little or no upfront capital outlay. The program is designed so that building owners lower their operating costs and, with the savings generated, pay for eligible water, energy efficiency and distributed generation improvements by taking advantage of affordable, long-term financing. Owners see immediate savings on utility bills by investing in efficiency or generation upgrades, and are cash-flow positive upon completion of the work. C-PACE can be used to pay for new heating and cooling systems, lighting improvements, solar panels, water pumps, insulation and more, for commercial, industrial, agricultural, non-profit and multifamily properties. This program accelerates upgrade investments in existing buildings, empowering owners to use their available capital on revenue-generating items including employees, technology and products. C- PACE was identified by Scientific American as one of the top 20 “world changing” ideas as it provides a new source of property-secured financing for energy efficiency and water conservation retrofits that does not affect conventional lending sources and does not compete for capital with other investment opportunities. 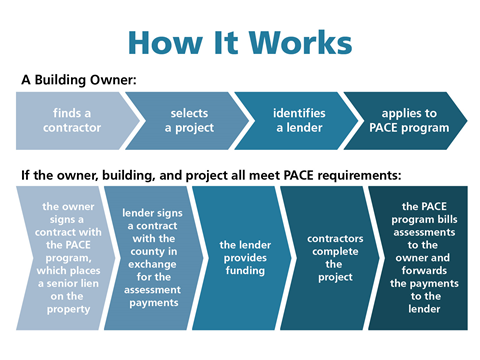 How does PACE work in Texas? The owner of a commercial, industrial, agricultural, non-profit or multifamily property chooses eligible improvements, a contractor and a private lender. The building owner applies to the C-PACE program for confirmation of building type and improvement eligibility. The program administrator provides technical support and administration services. If the project meets all statutory and program best practices, it qualifies as a C-PACE project. Through the program, the local government allows the property to become responsible for the repayment, via a voluntary senior lien for the cost of the improvements, in exchange for the economic improvement on the property. The lender then provides funds to pay for the project. The property owner installs the eligible upgrades and a project review is conducted by an independent third-party. Owners repay the cost of eligible improvements over a period of up to 20 years or more, with payments secured by voluntary assessments (similar to sidewalk or sewer district assessments) on the property. The energy and/or water savings are structured to exceed the annual assessment payment, resulting in projects that are cash flow positive. As the C-PACE assessment is tied to the property, the assessment automatically transfers to the next owner if the property is sold. This straightforward approach encourages commercial building owners to upgrade infrastructure using the most-efficient technologies. Even though a higher up-front investment in a more-efficient product or technology can save operational expenses and reduce emissions over the lifetime of the equipment, many times the least cost replacement option is chosen because of the initial price tag. By selecting the less expensive up-front option, property owners forgo far greater long-term operational savings. As commercial building owners qualify for C-PACE based on the equity in their property and not their income, the base of financeable projects is expanded and new private investment can be brought into communities. Where is C-PACE in Texas? Local regions must opt into the program in order for building owners to be able to take advantage of C-PACE. Currently available in 13 regions across Texas, that number is growing. To date, the counties of Brazos, Cameron, El Paso, Fort Bend, Hays, Hidalgo, Jefferson, Nueces, Travis, Willacy and Williamson, as well as the cities of Dallas and Houston have established programs. All are market-based and flexible, allowing property owners to do business with the parties of their choosing at the lowest possible administrative cost. Additionally, a high level of consumer protection is included to ensure that the projects will deliver the anticipated savings and are based on the “PACE in a Box” model, designed by over 130 Texas stakeholders and used in every Texas PACE program. The Texas PACE Authority, a private non-profit, administers this model program in all of the Texas PACE regions. Complements historic grants, economic development incentives, rebates, tax incentives, etc. In the aggregate, PACE improvements will promote long-term economic development in Texas by helping the state obtain energy and water security, grow and retain jobs, improve property values and reduce harmful pollution. In July, the largest C-PACE project to date in Texas, and the third-largest in the nation, closed in the City of Dallas. Alterra International, a Dallas-based global real estate development company, obtained $23.9 million in private capital at advantageous terms for the energy and water saving upgrades to the historic Butler Brothers Building. The 1910 nine-story mercantile warehouse had long been an empty eyesore across from City Hall. The redevelopment into 238 apartments, a 270-room dual-branded Fairfield Inn/Town Home Suites by Marriott, and retail and office space is expected to spur additional revitalization in the area. The largest shopping mall operator in America, Simon Property Group, has closed five C-PACE projects throughout Texas over the past year. Using C-PACE financing, Simon funded a number of improvements including interior and exterior LED lighting, HVAC replacement, smart glass, heat reducing awning technology, low-flow faucet upgrades and conservation updates to water features and irrigation technology. Contributing to the creation of nearly 50 jobs across the state. The ability of Simon Property Group to close multiple projects in different cities on the same day demonstrates one of many benefits of the uniform Texas “PACE in a Box” model used in every Texas PACE program. Commercial buildings are responsible for an enormous amount of resource consumption and greenhouse gas emissions. New technologies help the state make the most of a limited water supply and develop an electricity grid that is cleaner and more reliable to sustain significant population growth. As the demand for more efficient buildings in Texas increases, a market-driven solution such as C-PACE fills the gap. Texas C-PACE answers the question, “How are we going to pay for it?” This voluntary financing tool is transforming how developers, owners and contractors look at projects, proving that there is a clear path forward to operational savings brought about by energy efficiency, distributed generation and water use reduction improvements in existing buildings. Visit www.texaspaceauthority.org to get involved and learn more. Charlene Heydinger serves as President for The Texas PACE Authority (TPA), a nonprofit, 501(c)(3) third-party administrator for C-PACE programs across Texas. A Q&A with USGBC Texas Advocacy Chair David Matiella, UTSA College of Architecture, Construction and Planning, Co-Founder of Green Money Search. David, you’re a full-time professor. How did you get this volunteer advocacy gig? I began serving on the advocacy committee in 2003 and eventually gained enough experience to become chair of the statewide committee. I’ve now served in this capacity for the past four sessions. It’s exciting, invigorating and always challenging. I take special joy and pride in getting to facilitate conversations among the best building professionals in the state, and then I bring that knowledge to bear in front of people who make or propose policies to impact the built environment. I take special pride in bringing the message of green building and sustainability to those who create public policy. Communicating the social, environmental, and economic benefits of green building is a passion. We help to communicate the potential of what greener buildings can do for the state of Texas. You’ve got a great attitude for a guy who must get disappointed a lot. What about this work gives you hope? It’s true that last November's election was a tough pill to swallow for those concerned about environmental issues and sustainability. We see recently that the President intends to signal our departure from the Paris Climate Agreement. This is no positive news. But here in Texas, state legislators have an important task to consider legislative decisions that are best for Texas. Regardless of the disarray in Washington, Texas is poised to chart its own course to a sustainable future with good leadership. Whether these leaders are blue-state or red-state, Texas leaders share a deep sense of responsibility on many issues. More than ever, there is a need for us to work together to devise solutions that will take our built environment in a positive direction to benefit Texans, and to do so in a way that’s environmentally sound. How do you begin to design green policies that can withstand this environment? As with each session, we started back in August trying to take a temperature of what might come across in terms of green building policy. We assessed the headwinds from the previous year in terms of sustainability for issues at the international, national and local levels, and how these may indicate opportunities for sustainable development. When the November election did not result in recognition of the issue of climate change, we felt the need to look as closely as ever before at pragmatic solutions, and to focus on the core competencies of the USGBC and our mission-driven organization. We proceeded to do what we always do: we mobilized our boots on the ground to hold important events in Houston and Dallas - thanks to the hard work of fine advocates from around the state, we learned about our leaders’ legislative priorities. By January we were beginning to have some real conversations about policy proposals. Yet again, we realized that we had the opportunity to reaffirm our non-partisan role, our expertise in the professional community, and to look at what makes sense for Texas at the nexus of social, environmental and economic prosperity. From there, we reached out to offices and constructed a legislative agenda that was finalized ahead of our February 28th Advocacy day at the Capitol. What bills ended up on this year’s agenda? I was excited to be part of Advocacy Day in Austin back in February. As a North Texas Regional Council Director who lives in a LEED-certified home, I wanted to share my voice. I even like to think I made a difference. Is this just wishful thinking or do they really listen to citizens like me? Thanks for attending and yes, it’s very valuable when people show up at the Capitol in person. Personal visits are much more valuable than phone calls, although making the calls matters also. No matter what end of the spectrum you’re on, legislators and their aides will listen to you, especially if you are their constituent. Those visits are never superficial. We had more than 40 advocates such as yourself attend the training and office visits for Advocacy Day, which created a strong voice for the Texas chapter. For the volunteers who took time to visit with their representative or senator – the importance of that cannot be overstated. At the end of the day, it comes down to people making decisions, and those people care about the interests of voters and taxpayers in their districts. What was the outcome of these bills? We saw several of the bills that we threw our support behind make it to the Governor’s desk. Anytime that this happens, it’s a big deal. These included SB 59 Filed by Sen. Zaffirini, a bill to support state agencies and higher education institutions. Also signed by the Governor was HB 1571, filed by Rep. Paddie, which will help facilitate energy-saving projects for local governments by expanding applicability of Energy Savings Performance Contracts. We consider these positive steps toward a sustainable future and a greener built environment. USGBC Texas plays a significant role because of our efforts. To achieve this, we had an excellent intern Michelle Mendoza, who I leaned on heavily in the organizing role. The advocacy committee themselves gave us great input and work. Advocates in the Gulf Coast region area such as Natalie Goodman helped organize a December legislative meet and greet in Houston. Letter-writing campaigns in the North Texas region were also critical to our momentum. What is the accomplishment you are most proud of from this session? Critical to our work this session was the formation of the Green Schools Caucus, which is chaired by Representative J.M. Lozano. As a result of his chairmanship, we were able to hold our first meeting of the Green Schools Caucus on May 18, which was attended by several legislative offices including the Speaker’s office. That same day, Chairman Lozano read House Resolution 2090 on the floor of the House of Representatives to recognize and support Green Schools. Our group of five key presenters were recognized including Sangeetha Karthik and Janah St Luce with Corgan & Associates, who presented a case study of the Lady Bird Johnson Middle School. Their presentation helped us take an abstract idea of “green schools” and make it tangible by walking them through its list of net-zero attributes. Mike Dieterich from RISE industries was also present to show case studies of green schools from an operations and maintenance standpoint. Advocacy Advisor Ken Flippin and I were also present. Building on our momentum from the Green Schools Caucus and HR 2090, House Resolution in Support of Green Schools, we are developing a list of interim charges that we will give to Senator Lozano’s office. These interim charges will take the form of proposals for studies that examine the effectiveness of high-performing buildings and schools. These interim charges and studies will be effective tools to build legislative measure for the next session. With these actions, we believe that we are laying the groundwork for important legislation around green buildings and green schools in particular for years to come. Do you see schools could be a gateway to better buildings in Texas? They certainly have that potential, yes. Schools are important buildings to all of us, and therefore a priority in terms of building improvements in the state. Creating the buildings that educate our kids with better energy efficiency, performance and indoor air quality also translates into a “living lab” for sustainability education, which is essentially STEM education. Teaching our kids about energy use and technologies while giving them the benefit of well-being is a win-win for everyone. What do you need from us now? Local engagement is something I want to continue with moving forward. We must continue to communicate the immediacy of climate change, the benefits of sustainability, and explain the role that green building has to play as a solution to these complex issues facing humanity. We have to do that to remain effective. There’s an opportunity here for better dialogue from micro to macro. We must recruit new leaders within USGBC and be prepared to lead with our mission-driven organization. Now more than ever, our advocacy work is important at all levels, local, state, and national. Each of us has an opportunity to be leaders for sustainability, but we must be willing to do the necessary work to help achieve these goals. More than ever, we need your knowledge, expertise and your work for USGBC here in Texas. It’s time to take a new look at the way we build green buildings. The green building movement has been around for 20 or 25 years, and has (almost) come into the mainstream in many building markets. We’re getting pretty good at it, right? But real breakthrough in the way we build buildings will only come about with changes like using the Integrative Design Process. For example, many people believe that the best way to build a green building is to add new, usually very expensive, features. Some of these “Gucci” options might include high-end mechanicals or expensive green-labeled finishes. However, adding green technology and products is not always the best way to build a green building. In fact, the added expense may prompt the stakeholders to “value engineer” the green features out completely. I’m all for new technologies, energy-efficient mechanicals, and sustainably sourced materials. And this strategy is certainly one way to earn a LEED certification. However, in some cases it’s just throwing new features into outmoded building designs. Isn’t it time for a breakthrough in the way we design and build buildings in the first place? Let’s imagine the alternative. What if the project team designed the building with an energy-efficient envelope, passive design features, and waste energy recovery? And what if these measures reduced the size of the HVAC equipment needed in the first place? Then the project could afford energy-efficient mechanicals because the equipment needed is not so large. What if the project team rethought the way materials were used, creating a building with simpler finishes that were naturally greener and less expensive? True Integrative Process takes building systems into account and finds new ways to create buildings. It evaluates the building using new process and tools, early in the design phase, processes and tools that can lead to a better building. The end result is a building that is built right…without skyrocketing costs. The Integrative Process will be the topic of our upcoming NTX Sustainable Showcase. We invite you to register for Sustainable Showcase and come learn more about designing and building using the Integrative Design Process. Our workshop presenter will be Bill Reed, founding board member of the US Green Building Council and co-author of “The Integrative Design Guide to Green Building: Redefining the Practice of Sustainability”. If you’re looking for a whole new way of looking at sustainable building design and construction, then Sustainable Showcase and the Integrative Design Process can help you get there. How Can We Combat Climate Change? Education! America is in the midst of one of the most profound and rapid societal shifts in history. Today's generation of children is the first to grow up indoors. Their plugged-in lives are largely devoid of exploring the natural world and we are just beginning to understand the ramifications of their virtual world. This movement indoors is not benign; there are costs to the health of our children: attention difficulties, hyperactivity, childhood obesity, diminished use of senses, disconnect from things that are real. Additionally, if children are detached from nature, how will they learn about, understand, and value nature? How will the next generation care about the land and be stewards of its resources? Did you know that environmental education can help children perform better in social studies, science, language arts, and math? Our children deserve the best education, and with proposed budget cuts to national programs that support energy & water conservation, our mission to promote sustainability is now more important than ever. April is Earth Month and with Earth Day Texas right around the corner we have the opportunity to re-engage the community and local industry professionals about the modern environmental movement; inspiring citizens around the world to demonstrate their commitment to a healthy and sustainable world. 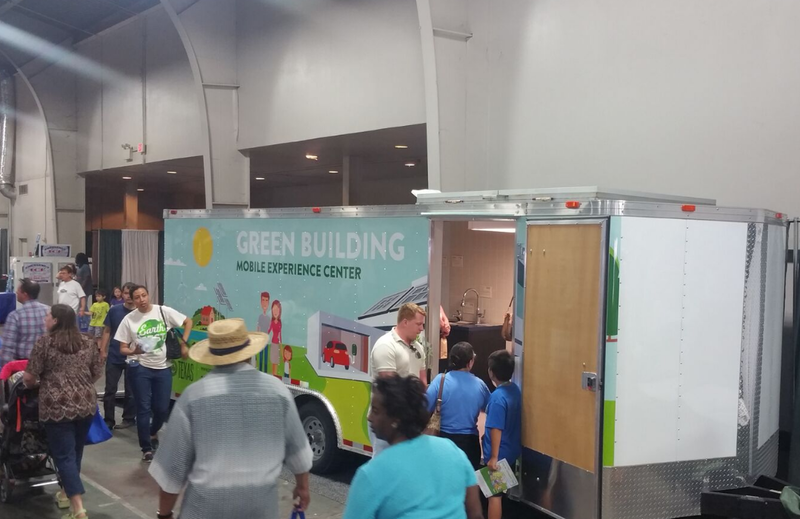 One way that the local U.S. Green Building Council (USGBC) Texas Chapter is doing this is through educational outreach with its Mobile Experience Center (MEC). It’s no Tiny Home, but something even better! The Mobile Experience Center is a 24-foot enclosed trailer that includes an interactive multimedia space – so that visitors can actually see, feel, touch and learn about green building design, construction, as well as building operation and maintenance strategies. Through videos, touch-screen applications, and real-world demonstrations of energy-efficient lighting, appliances and plumbing fixtures, the Mobile Experience Center makes the concept of “sustainability” tangible to thousands of visitors. Sponsors benefit from creating, developing and enhancing credibility, engaging in highly targeted marketing, leveraging word-of-mouth potential, increase brand recognition, and give back to the community. Since the trailer has both residential and commercial products, local business owners can also learn about strategies and equipment that can be used improve their bottom line. Many of our volunteers are engineers, architects or contractors and are knowledgeable about various green building practices and methods for reducing operational costs. Data collected from last year's travels across North Texas estimated that the solar panels generated about 1,300 kWh electrical over the course of the entire year (equivalent to 2,190 miles driven by a car or preventing 1 metric ton of CO2 emissions). Now that the USBGC Texas Chapters are united, the MEC has the potential to travel across the vast state of Texas to various trade shows, conferences, and schools. Upcoming appearances include events like GRO El Paso, the USGBC Texas Energy Summit (Houston), and the North Texas Sustainable Showcase. Interested in having the MEC at one of your events, schools, or social? Visit our website here for more details on event requests. 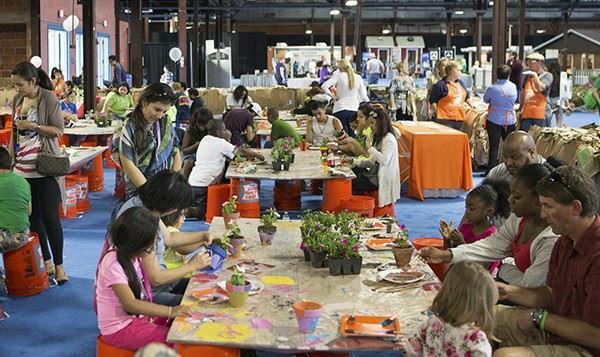 The MEC is scheduled as an exhibit for this year’s Earth Day Texas event to be held Friday, April 21st – Sunday, April 23rd at Fair Park in Dallas. Event hours are 10:00 AM – 6:00 PM. This three-day free event is held in April to celebrate progress, hope, and innovation and is the largest event in the world of its kind. 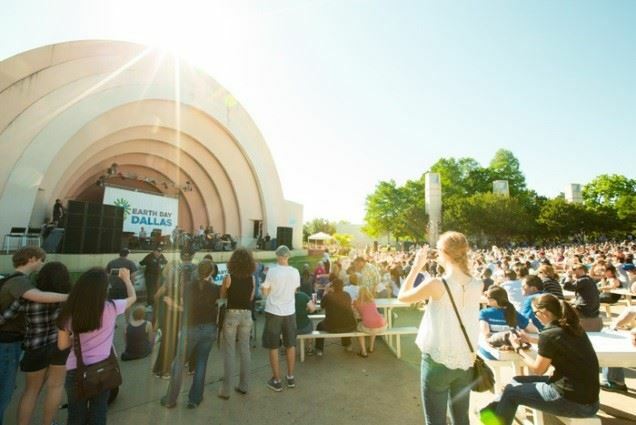 Earth Day Texas brings together environmental organizations, businesses, academic institutions, government agencies, speakers, interactive programming, and subject matter experts along with live music and sustainable beer and food pavilions. Earth Day Texas creates a fun and engaging atmosphere for thought and experiential learning while encouraging attendees to be the change they wish to see in the world. In 2016, Earth Day Texas hosted over 130,000 attendees, 700+ exhibitors and 250+ speakers, becoming the largest annual environmental exhibition and programming initiative in the world. The MEC not only offers the community an opportunity to learn about existing technologies that conserve water and energy, but it also gives them the tools and resources to apply in their everyday lives. In an era where more and more children are disconnected from nature, USGBC recognizes the importance of making a real investment in environmental education and outdoor learning. Studies have shown environmental education engages students in learning, raising test scores, and encouraging youth to pursue career in environmental and natural resources. Teaching the community to become environmental stewards would not be possible without the help of our MEC Leadership Team and dedicated volunteers throughout the year. If you would like to volunteer at an upcoming event or join the development of bringing this amazing initiative all together, send a request below. You can also support by following or sharing on social media. Don't be deceived just because the lakes are full. Water will be an on-going concern for Texas businesses and homes as the population increases and temperatures rise. What do business owners, managers, and homeowners need to know about the current and long-term costs and availability of this quintessential natural resource? Find out on March 29th when USGBC Texas hosts its third annual North Texas Water Symposium. This symposium will focus on water security confidence, which the public and private sector need to continue making North Texas a viable place to invest in and conduct business. The intent of the North Texas Water Symposium is to inform and engage the public in dialogue on the state of water in North Texas. This year’s theme is “The Business of Water,“ so speakers will emphasize the business component with its many derivatives. Household decision makers and building professionals working with the residential sector will also benefit from understanding the statewide concerns around this critical natural resource that is both renewable and exhaustible. The average household uses 400 gallons per day for indoor and outdoor domestic uses, spending about $500 annually on water and sewage utility costs. In 2009, it was projected 22% of US households would spend more than 4% of their household income on water and wastewater fees. As water utility rates continue to rise faster than household income, water conservation must increase to improve the economic situation for our nation’s low-income households as well. All stakeholders should be present in order to understand the challenges as well as opportunities that will arise as water issues escalate in importance. The USGBC Texas has been pleased at the range and depth of water issues explored by the distinguished speakers who have participated in this series. Topics in our water symposium series have included: water stewardship; current historical and future impact of watershed, water quality, and water management issues on North Texas; long-term investment and planning for watersheds and the recent decreasing levels of North Texas reservoir storage; the impact of water on economic development in North Texas; property assessed clean energy (PACE) financing; and various options for water management. Any questions? Contact David Rodriguez, Program Chairman, USGBC Texas, Water Symposium Series at davidroyrodriguez@gmail.com. The 85th Legislative Session began on January 10th. and advocacy efforts are underway to promote favorable policies for greener building in the Lone Star state. Green building is projected to see positive growth for years to come, with its influence reaching across the U.S. economy and generating significant environmental, economic and social benefits. If you are eager to learn how to encourage your legislators to support sustainable building practices in Texas, join us in Austin for USGBC Texas State Advocacy Day. On February 28th volunteer advocates will convene at the Capitol in Austin for an advocacy training session where we will review the Chapter’s advocacy priorities and legislative agenda. Following this session, attendees will make legislative visits to offices in the Capitol during the afternoon. “Instead of walking in with big agenda, we have the advantage of walking in as educators on what can become positive and non-partisan legislation,” said David Matiella, Chair of the USGBC Texas Statewide Advocacy Committee. For details on the Chapter’s priorities for these impact areas, check out the Narrative of Priorities, the Advocacy & Policy section at http://www.usgbc.org/about, and review the 2015 Green Building Economic Impact Study. To participate in USGBC Advocacy Day, please meet at the Mitte Foundation Carriage House on February 28th at 11:00 am at 1008 West Ave, Austin, TX 78701. The event will conclude with a reception at Google Fiber Space located in downtown Austin at 201 Colorado St., Austin, TX 78701. Representative Mark Strama will speak. RSVP for the event below.